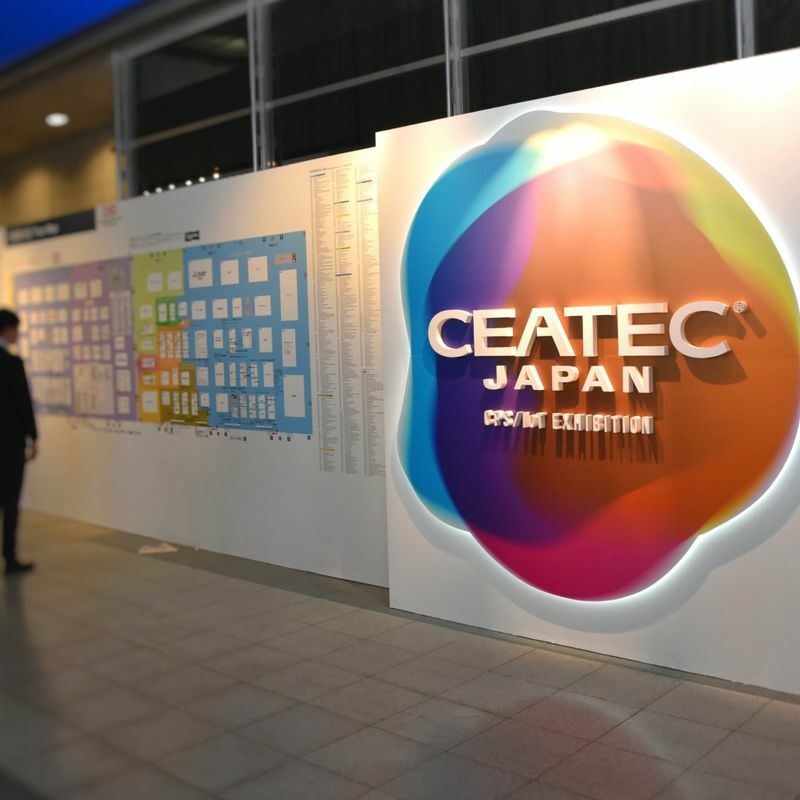 CEATEC JAPAN, the largest electronics and information technology convention in Asia, wrapped up a four-day stay at the Makuhari Messe convention and exhibition center in Chiba on Friday. The 2018 incarnation of CEATEC JAPAN (Combined Exhibition of Advanced Technologies) gathered together over 700 companies and organizations into Halls 1-6 of the huge venue for the annual extravaganza showcasing the latest in tech, IoT, consumer electronics, AI and CPS. While many of the exhibits at the convention could best be filed under ‘special interest,’ at least when it comes to what’s going on behind the scenes, plenty of the tech on display is geared towards smoothing over the rough edges of daily life. So, among all the circuit boards and semiconductors there was plenty going on at CEATEC 2018 for even the layperson to enjoy. Here are some of our highlights from the convention. 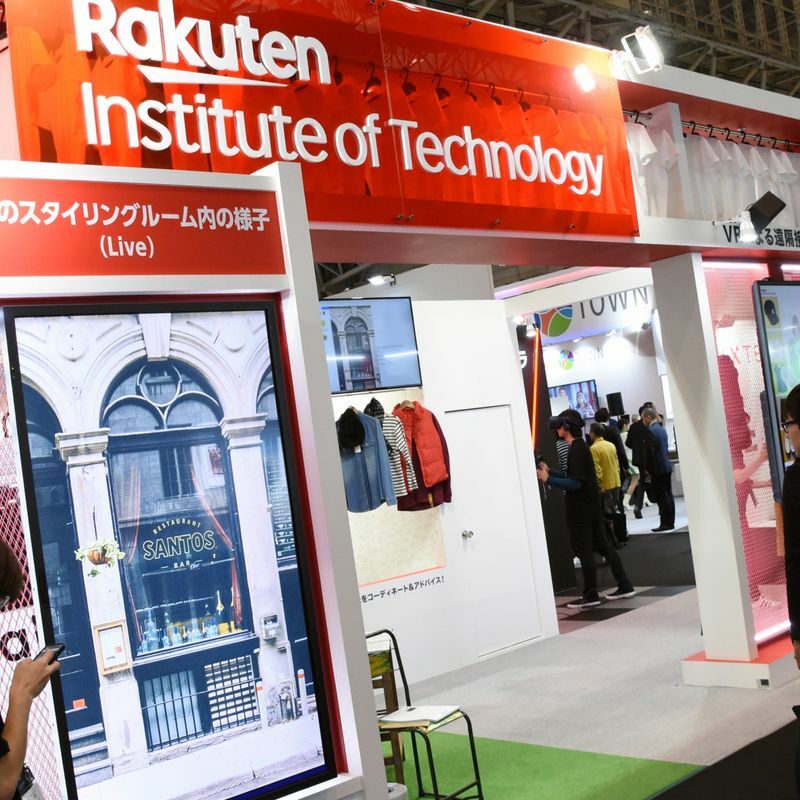 E-commerce giant Rakuten sent along its dedicated R&D wing, Rakuten Institute of Technology, to CEATEC 2018, to showcase what they are doing to address a fashion disparity between urban and rural Japan. “Rakuten brings fashion styling to Japan’s countryside,” read the opening of a press release at Rakuten Institute of Technology booth where CEATEC visitors could try out a Remote Styling Support System, part of efforts from Rakuten to overcome challenges faced by people living rural areas of Japan in learning about, trying on, and receiving advice about the latest fashion trends, and ultimately keeping pace with the city. 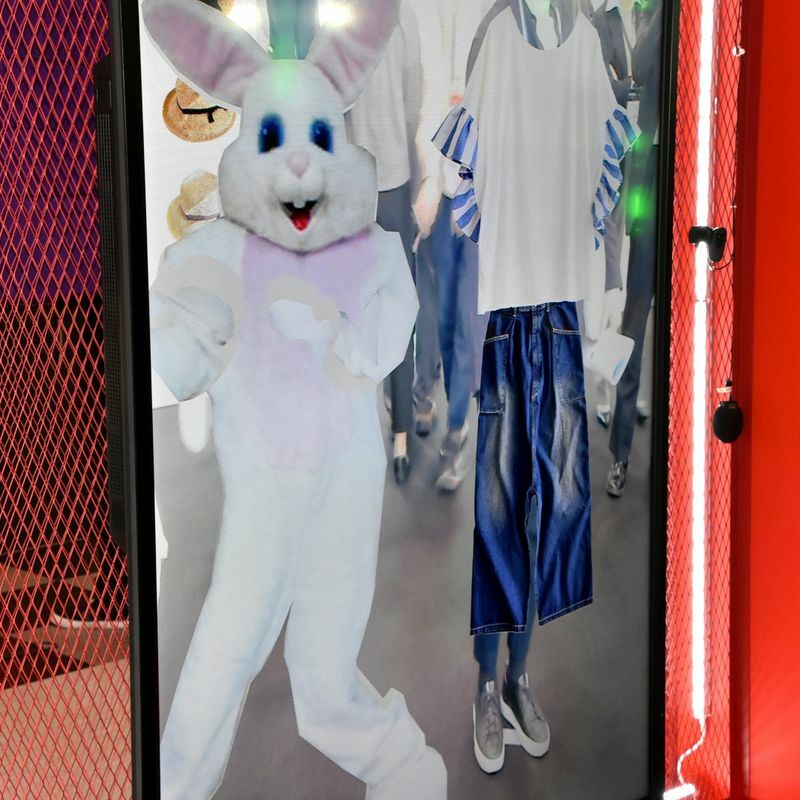 To try out the Remote Styling Support System visitors stood on a specific spot in front of a digital display resembling a mirror upon which their image appeared while a rabbit character, acting as store clerk, inquired about what color they like and from there began a process whereby fashion items were recommended and superimposed onto the customers image. “We interviewed top fashion merchants on Rakuten Ichiba (Rakuten’s flagship e-commerce site), none of whom own physical shops, and found there were three major constraints on the fashion shopping experience,” explained project lead Soh Masuko, senior manager of the Future Merchant Design Laboratory of the Rakuten Institute of Technology. With the Remote Styling Support System the store clerk rabbit is voiced by remote fashion advisors in order to avoid any potentially awkward face-to-face contact. The system was actually trialed as an experiment by Rakuten at an event held in Aizu Wakamatsu City, Fukushima, in July this year with the system housed in an e-NV200 e-car provided by Nissan Motor Company. Over at the Hitachi booth there was a display of robot-on-robot communication in which Sony’s robotic dog Aibo issued instructions to Hitachi’s robotic cleaner minimaru, by way of a human being issuing instructions to Aibo. 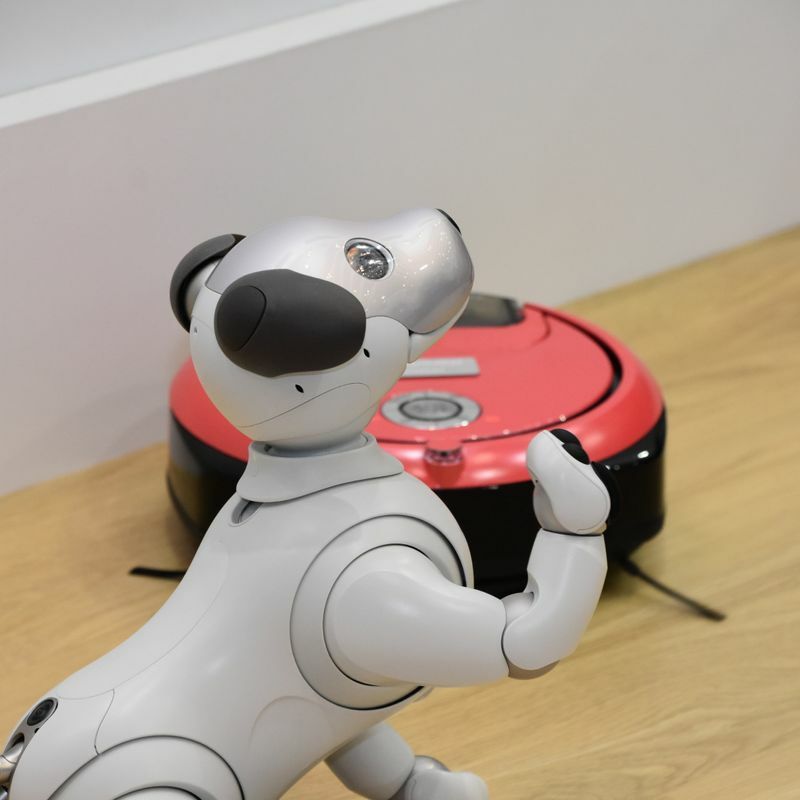 While some might find the sight of a robotic dog handing out household chores to a sleek bit of cleaning kit a little dystopian, plenty at CEATEC seemed suitably charmed, evidence perhaps that Hitachi’s exhibit slogan of “Communication with a robot will improve our lives” might carry some weight. Communication between robots, however, will perhaps need to become a little more fluid before it can rival watching YouTube videos of puppies hitching a ride on a minimaru. As if English teachers in Japan weren’t being undermined enough by the cut-throat competitive eikaiwa market as it is, Sharp is throwing their hat into the mix with the RoBoHoN, and in the kids market no less! 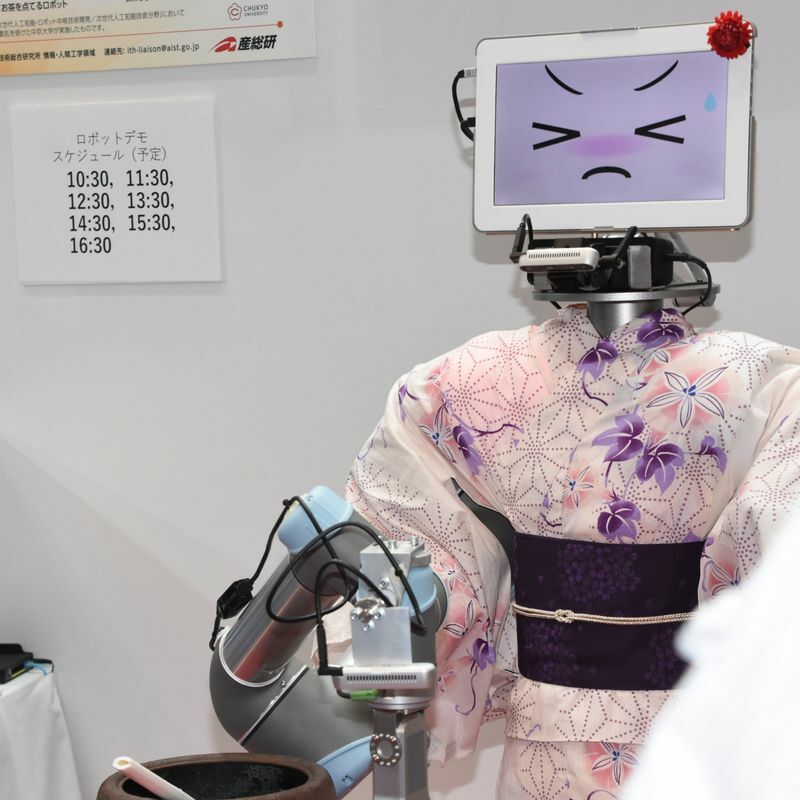 At their booth Sharp also explained that RoBoHoN’s cute factor has been shown to increase motivation among children to engage and learn, and after repeated free-talk sessions with the device, that children have displayed an increase in the number of English-language remarks made. 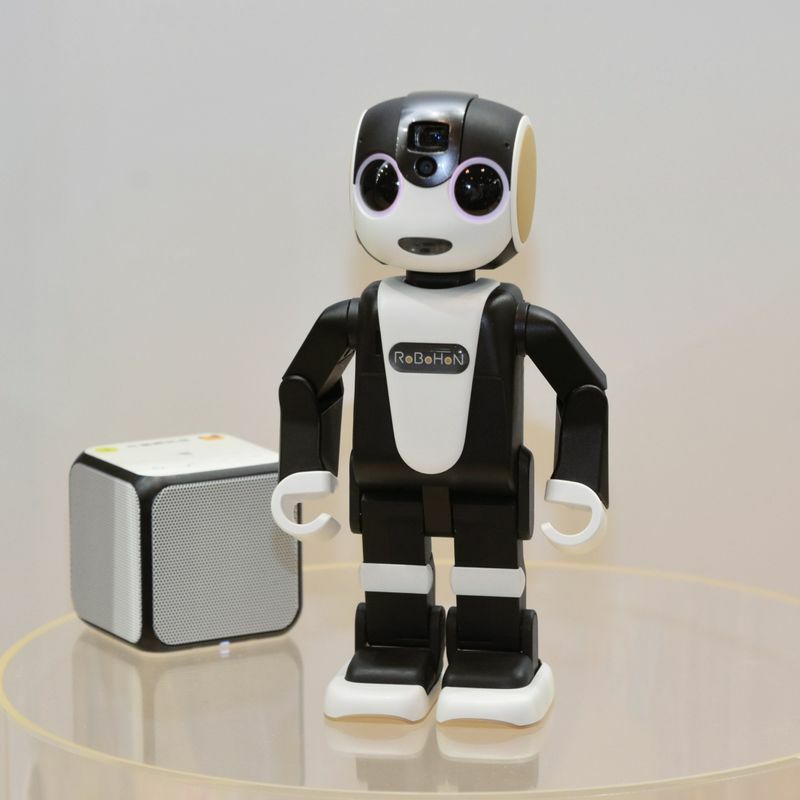 RoBoHoN can be programmed to accommodate a number of conversation scenarios and can even explain to users how to do such programming. Oh, and it doesn’t seem to kick up a stink about having to come to work in fancy dress. Perhaps we’d better pack up our textbooks and homemade flashcards and head to … China? 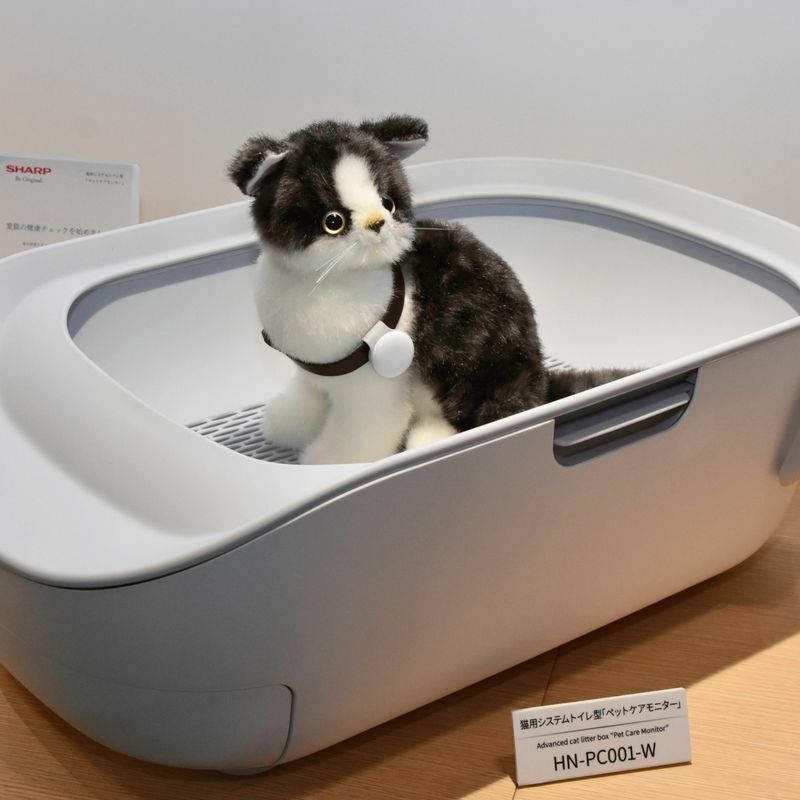 Visitors to CEATEC were afforded a look at Sharp’s COCORO PET, an advanced cat litter box or ‘pet care monitor’ and mobile application which monitors the weight of a cat’s urine, frequency of visits to the tray, and duration of stay, among other factors, to enable pet owners to keep better track of their pet’s health. AI is used to analyse the data collated and alerts are sent to the pet owner’s portable device when changes are detected. News of Sharp’s smart toilet dropped in June of this year with the tech going on sale in July. The domestic pet market is on the up in Japan with cats becoming increasingly popular, particularly among an ageing population where they are seen as more low-maintenance than dogs. In December 2017 the Japan Pet Food Association released the findings of a survey that revealed cats had overtaken dogs as the pet of choice for the first time since the annual survey began in 1994. No, this has nothing to do with a pot-bellied, middle-aged man clinging to the last vestiges of his youth by slapping on some ABBA at a village wedding. 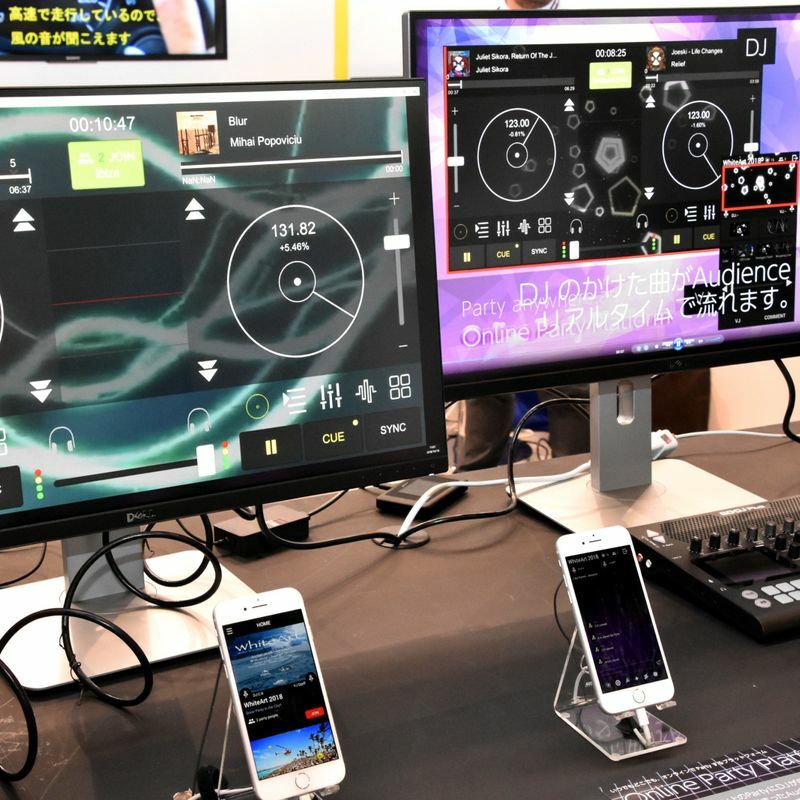 In June this year Tokyo-based Open Stream announced development work on an open-stream, anytime, anyplace, cloud platform where DJs and dance music fans could gather (on said cloud) for a kind of online party, freeing them of the constraints of time and place. 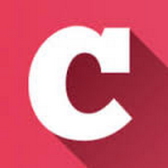 The prototype for Open Stream’s Online Party Platform was given an airing at CEATEC 2018, the project riding on the crest of an EDM wave that picked up momentum during the back end of the noughties, rising to become a 7.1 billion dollar industry (according to the 2016 IMS Business Report). The platform’s origin, however, does have echos of our elderly DJ. “The person who was the inspiration for Online Party Platform is a DJ, but as they’ve gotten older they’ve found it harder to continue with the typical life of the DJ, so they came up with the idea for this platform.” said a representative at the Open Stream booth. Online Party Platform then, allows both DJ (and VJ) and audience to enjoy dance club music without needing to go to the club, and the battling through long queues, meeting dress codes, and getting shunned in favor of smug VIPs that such an activity can entail. For DJs, the application provides two turntables and a mixer along with more advanced DJ functions courtesy of a collaboration with professional audio company JDSound. 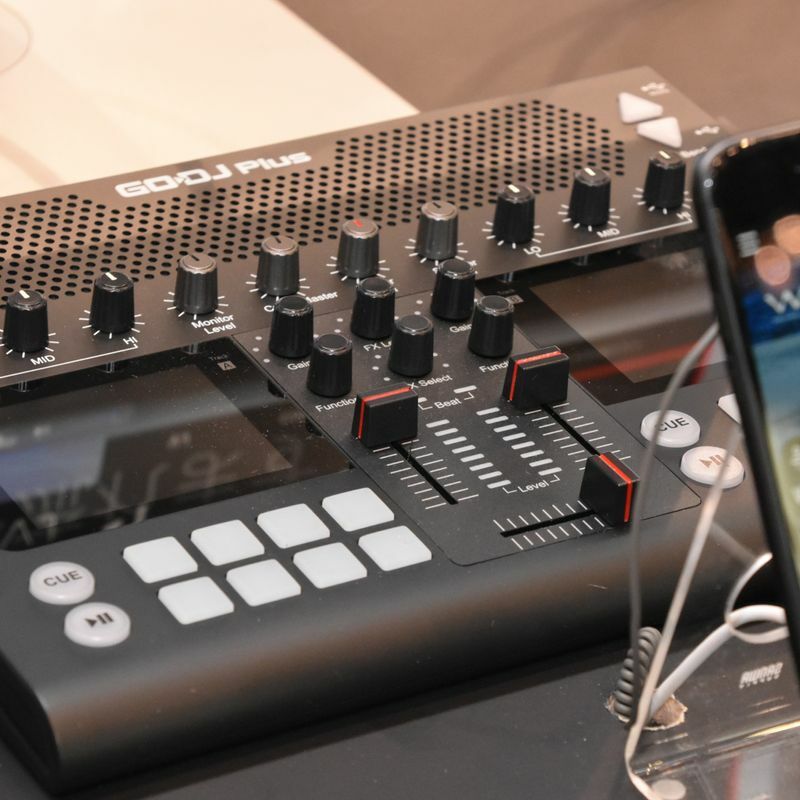 While controls are application-based at present, developers plan to enable hook-ups with existing DJ hardware. Audience members can show their appreciation for the music in real time, interact with one another (dance-offs aside), and revisit favorite tracks from a DJ’s set. As someone who is beginning (and that’s being generous) to look awkward, nay weird, in the clubs of Roppongi, Online Party Platform looks like it could allow me to get up in the cluurrrrb mood, without having to leave that comfortable impression in the sofa I’ve been working on in recent years. 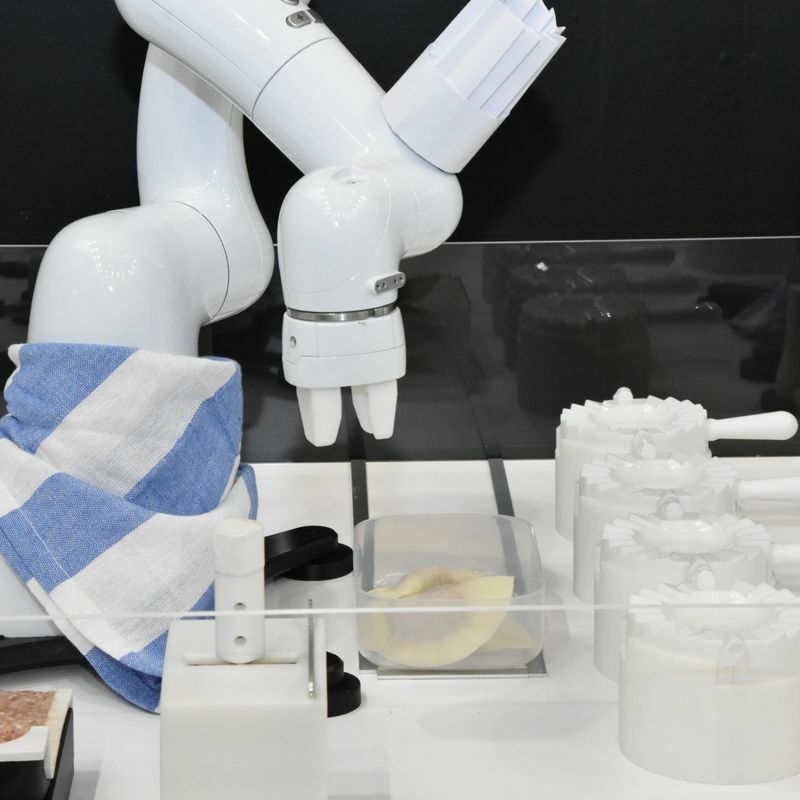 Lawson Inc., this year, became the first retailer to have an exhibit at CEATEC, the convenience store chain mainstay using their booth at the 2018 convention to showcase a vision of convenience stores future -- unmanned and with robots that can put together konbini food staples. 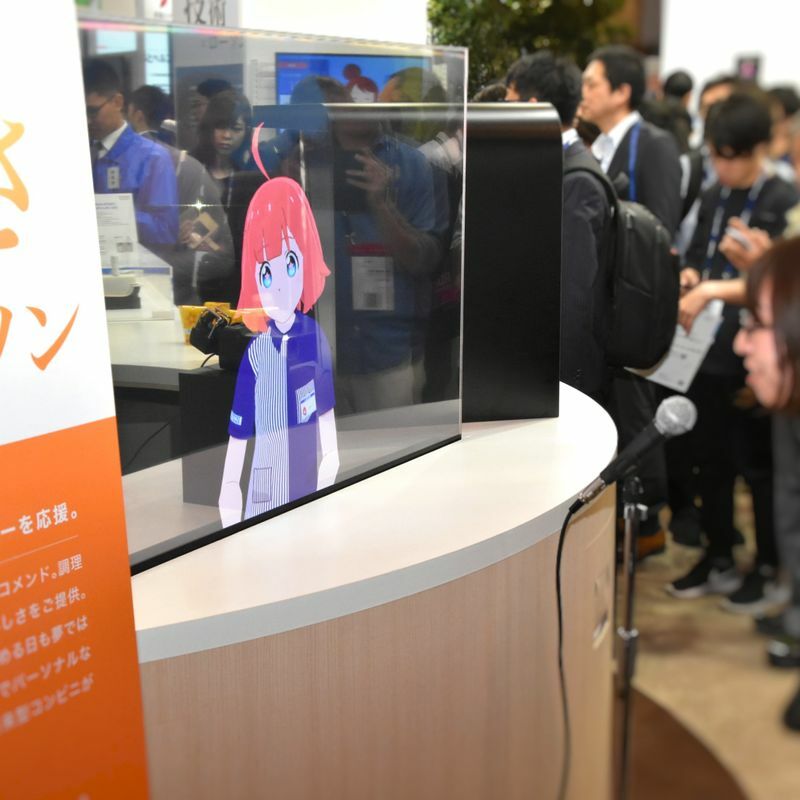 In fact, the Lawson booth appeared to be one of the most popular at this year’s event, with many visitors enjoying the chance to interact with the store’s AI driven virtual clerk. News media reports say that Lawson plans to open the doors to such stores at locations across Japan from 2025. In the meantime a generation of university and language students breathes a sigh of relief that they will have graduated by then. AlgoRoid -- the name alone should be lauded with praise in this CEATEC visitor’s book. AlgoRoid is one of a number of lighter, entertainment-based exhibits on show at the booth of Bandai Namco where the video game developer showcased creations from their new brand, BANDAI IoT WORKS which delves into the Internet of Things to explore the Internet of Toys within. 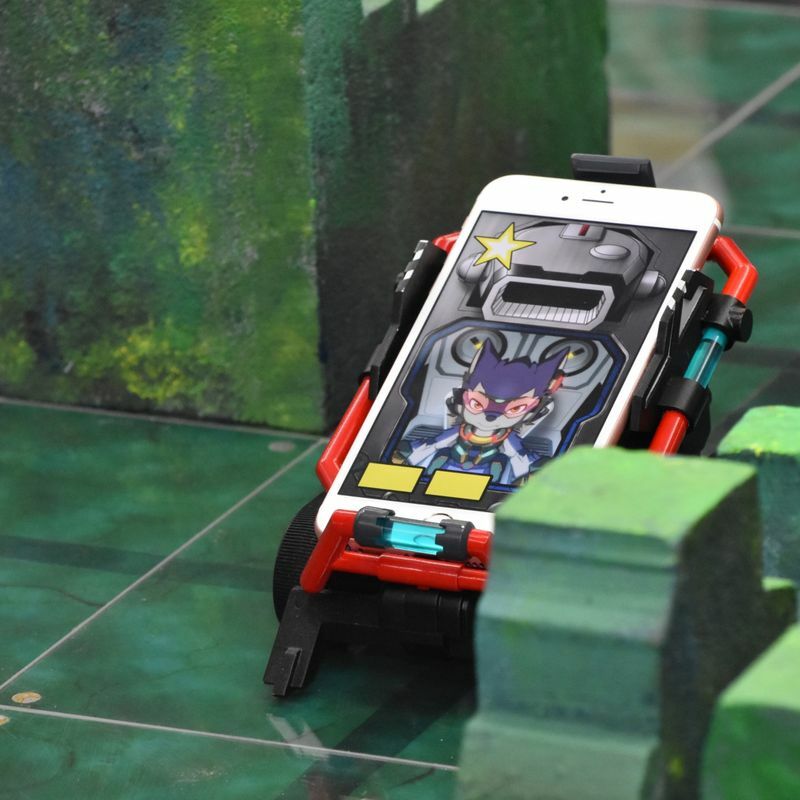 With AlgoRoid Bandai deliver an example of how they are building a new relationship between toys and users through their PLAY STEM project which sees the developer inject elements of ‘play’ into the popular STEM system of education. Gameplay for AlgoRoid sees autonomous robots, that move and think on their own by way of smartphone-based programming, battle it out against of backdrop of ancient ruins and the mining rights to some supernatural sand. 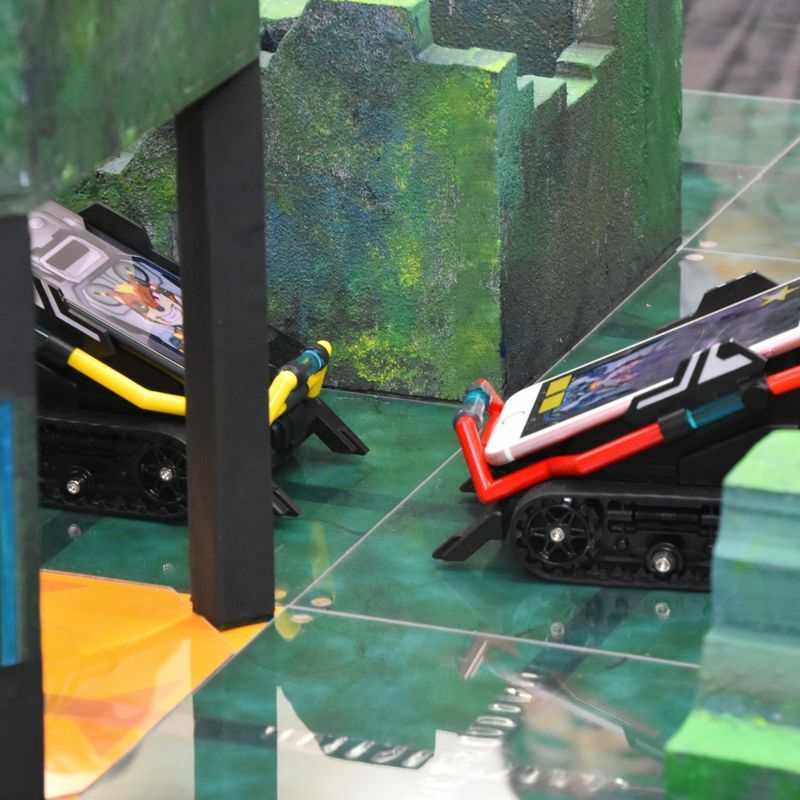 OK, so the scenario requires a leap of the imagination, and seems almost perfunctory, but the caterpillar riding robots look cool, and your smartphone screen doubles as the mind and body of the driver enabling the whole set-up to issue sound effects and graphics that reflect the action. Single play, co-op modes, and team competitions are among the game play options. Whether or not gamers will feel comfortable sending their precious smartphones into battle, remains to be seen, but it’s good to see a developer exploring more tactile forms of entertainment for young (and not-so-young) minds. 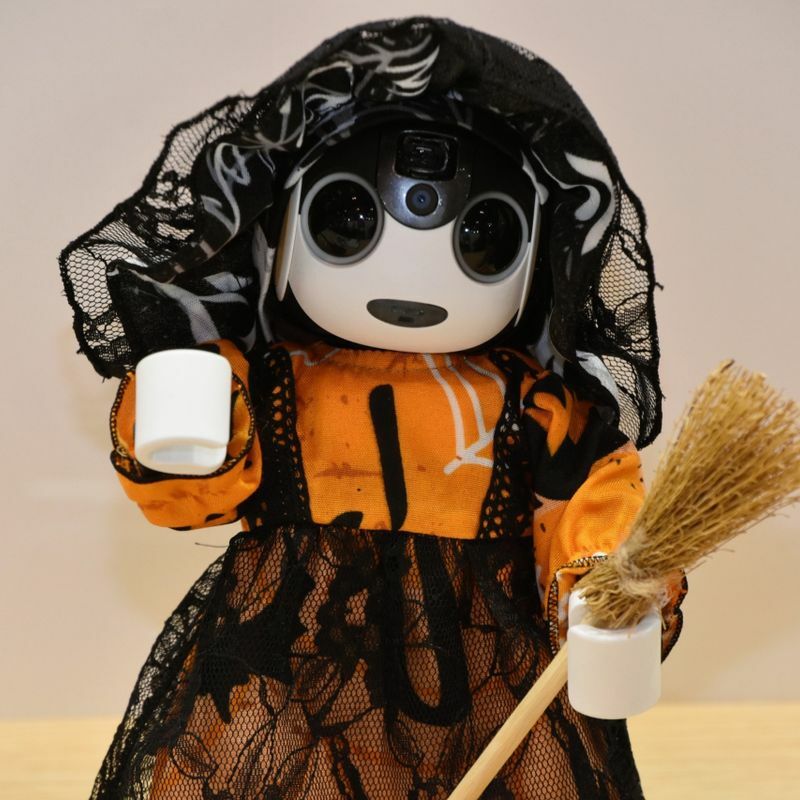 OK, so while our own brain-box limitations limit us to just about being able to brew our own cup of tea, the R&D team at the Hashimoto Laboratory of Chukyo University (Nagoya) have come up with a robot that can do likewise, in traditional Japanese form. 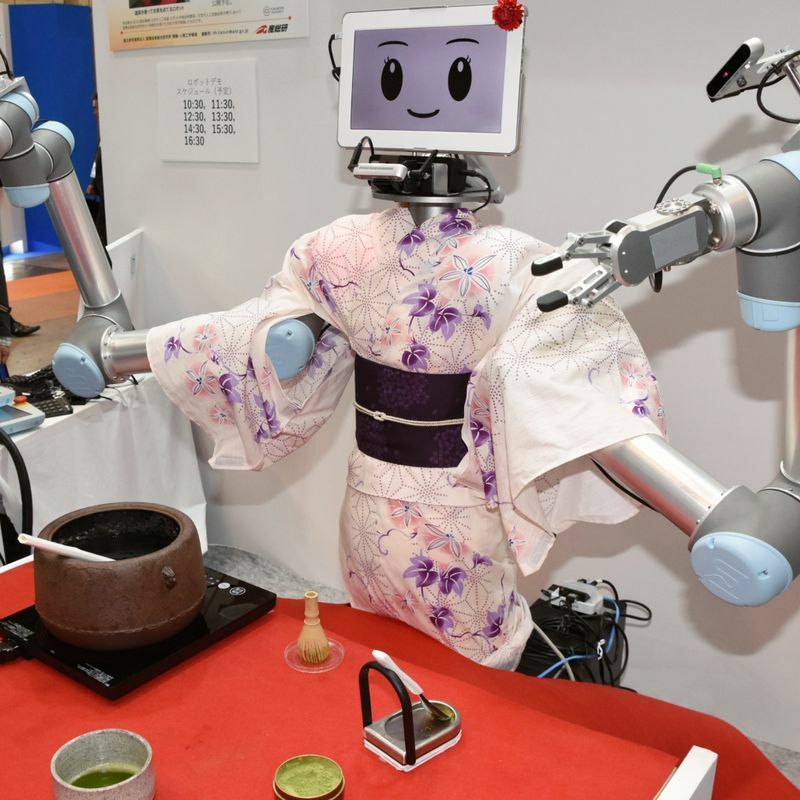 The team at the laboratory specializes in fields related to developing AI for robots (which is about where our mind starts to ache), and brought a robot to CEATEC to show how ‘deep learning’ (a form of machine learning) can result in object recognition to the point where a robot can make a cup of tea, -- Japanese green tea style, tea whisk and all -- as was demonstrated to a throng of onlookers at the convention. See more of our CEATEC JAPAN 2018 highlights in the gallery. Did you make it to CEATEC 2018? Anything catch your eye? Let us know in the comments.